Participants were put through a simulation exercise to experience the effects of dementia. 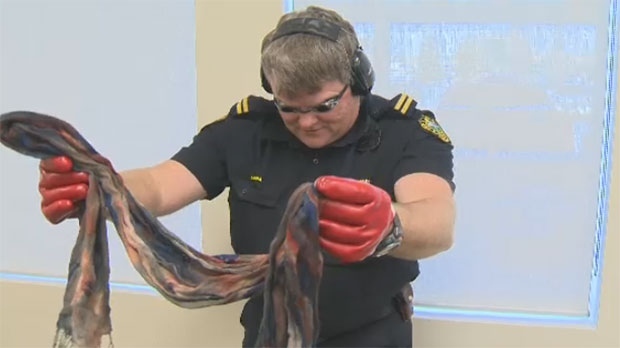 First responders and front line workers were given a first-hand look at what it’s like to suffer from dementia at a workshop in Okotoks on Wednesday. The Brenda Strafford Foundation hosted the Dementia Friendly Communities demonstration project at the Okotoks fire hall and the program is designed to help others recognize the needs of those affected by the disorder. The project is the first in Alberta and the goal is to help people living with dementia and their caregivers to feel safe and supported in the communities that they live and work in. “This is absolutely important, certainly in an aging population, there will be people, as they age, that experience parts of dementia so this is all about raising awareness, coming up with some coping skills, giving community the capacity to deal with all the aspects of dementia in our population,” said Bill Robertson, Mayor of Okotoks. “I think for them really, just to understand what dementia is and how every day they can have their eye out for things that can happen in the community, people who are challenged, and just stepping up beyond what they would do as regular customer service, just to be there for the community,” said Jennifer Mallamo, Dementia Friendly Community Coordinator. Participants spent some time in the classroom and then wore items that limited their ability to hear, touch and see. They were then asked to perform some everyday tasks like, reading a list or opening a pill bottle to feel what it’s like to live with dementia. “We were asked to put on these gloves, where now I can’t touch anything properly and they’re clumsy. Then we were asked to put on some ear muffs, at which point that took away my senses, I felt uneasy, and then I was asked to put on these goggles, which took away most of my sight and then I was asked to perform tasks, at which point, I was scared, I didn’t remember what I was supposed to be doing and none of it was easy,” said Amber Pereira, who works at the town’s municipal centre. “People with dementia are one of the vulnerable populations that we deal with on a regular basis and it does have all these different iterations so for us having our firefighters understanding and empathizing a bit more just makes them better providers,” said Pat MacIsaac, Deputy Fire Chief. There are over 13,000 people in Calgary living with Alzheimer’s disease or dementia and another workshop will be held in the city in January. For more information on the Brenda Strafford Foundation, click HERE.